The Weber Grill gives the ultimate badge of honor to grill masters across the United States. Designed to handle the test of time, there is a Weber grill for every budget. These gas grills are able to carry out any bbq job thrown at them from simple hamburgers and hot dogs to cedar-planked salmon, grilled paella or even a Thanksgiving turkey. Weber makes over 100 grills in various configurations. It can be very time consuming to pinpoint the best grill suitable for your particular needs. Afterall, you don't want to pay for features you are never going to use. In contrast, you wouldn't want to miss out features considering this great American grill will be with your family for 15 years or longer. In this article, we will help you select the best Weber grill for your budget and your needs. Weber grills come in 3 series. The three most-popular models are the Genesis, high performance pro-level Summit grills, and the basic Spirit models. All models carry an industry leading 10 year warranty for parts. All Weber Genesis grills with 3 burners have 513 sq. inches of grilling area which accomodates roughly 20 burgers. The removable warming rack adds 156 sq. inches of space. Total dimension of a 4 burner Weber Genesis is W 59-inches x D 29-inches x H 47-inches (186 lbs). The 3 burners provide 39,000 BTU cooking power. Models with the searing station get a total of 9,000 BTU extra power in the sear zone. The side burner will provide you immediate access to an outdoor kitcen with 12,000 BTU power. The 4 Burner Weber Genesis II grills follow the same logic as the 3 Burner units. The 4 burner Weber grills have 646 sq. inches of cooking area which will accommodate approximately 28 burgers. An additional 198 sq. inches come with the removable warming rack. Total dimension of a 4 burner Weber Genesis is W 65-inches x D 29-inches x H 47-inches (214 lbs). Weber Genesis grills had myriad of changes in 2019. First the company trimmed down the lineup that was causing confusion among shoppers. The 2019 line up now follows a logical path both in terms of features as well as pricing. Genesis grills, including the frame and the side tables, are now taller. All models now incorporate stainless steel flavorizer bars. No more flimsy flavorizer bars that used to wear out quicker than the rest of the grill. Simplified Searing - a dedicated sear burner and a sear zone. Most customers did not understand the searing feature on the previous incarnation of the product. Single button "Infinity Igniter" became the default method of ignition across all Genesis gas grills. 4 burner Weber Summit Dimensions: W 66-inches x D 26.5-inches x H 50.5-inches (245 lbs). Each side table takes up about 15-inches. The built-in S-460 is 34-inches wide. 6 burner Weber Summit Dimensions: W 74.1-inches x D 26.5-inches x H 50.5-inches (289 lbs). Each side table takes up about 15-inches. The built-in S-660 is 42-inches wide. Grates play an important role in cooking performance. If your grates are not hot enough, the food will stick and create a messy situation for you. You will also not be able to sear effectively. Indeed, you will need to have hot grates for your "signature" grill marks. When your recipe calls for low heat, preheat on the highest setting as the first order of business. You can then open the lid while the burners are at the highest level and close the lid after a few minutes until the thermometer reads 500 F.
Heat up your grates and use a stainless steel bristle brush to scrape up charred bits. The smooth surface of Weber’s grates aid in cleaning and removing residual charred food and sticky sauces. Grilling is supposed to be fun. Running in and out of your kitchen for forgotten items makes the process less fun. Use the side tables to store your seasonings, tools, serving platters and plates. Conveniently prepare BBQ sauces on the sideburner. Give yourself some room. You will need flexibility to move food around the grill, so try not to cram food on the cooking grates. You may even want to create different levels of heat zones to accommodate the different foods you are grilling. The lid sure looks nice but it is actually there to control air flow. The lid also traps heat and smoke which lends flavor to grilled food. When you grill with a closed lid there is also less of a chance of flare-ups. Trust your BBQ and get perfect sear-marks and ideal color and flavor from food prepared on your Weber grill. One tip, stop moving the food around the grill. Achieve grilling perfection by not opening the lid too many times. Instead, invest in an instant-read thermometer to measure temperature and cooking progress. Modern day grilling is not just about meat dishes. You can prepare many other types of recipes with your gas grill. Over the past decade Weber built a great library of recipes and video content to make you a neighborhood hero. If you are short of time, it is a great idea to subscribe to Weber's email list for tips and ideas. It is a good idea to clean your grill two times a year. If you experience uneven heat, low temperature output from burners or too many flare-ups, it’s time for a good clean. Start your clean from the top and make your way to the bottom of the grill. Over time you will notice a "paint-like" black flaky deposit on the side of the lid. These flakes will eventually peel and fall on your food. Therefore, it is a good idea to clean them off using a brush. You can even wipe these deposits with a paper towel when the grill is warm. Weber has 3 functional tiers built on top of the burners. On the top you will see the cooking grates (we already touched upon the importance of cleaning the grates). Right under the grates you will find the triangular stainless steel flavorizer bars. Flavorizer bars help catch grease and turn that grease into smoke to add flavor of your food. Heat deflectors are right above the burners and distribute the heat generated by the powerful burners. Each of these tiers are modular and you can clean them with a stainless steel bristle brush. Cleaning the burner ports is especially helpful to allow for maximum energy is transfer as well as keeping your grill safe from flare-ups. When cleaning the burner ports be careful about the ignition electrode. The ubiquitous Weber grill has become part of the American fabric. 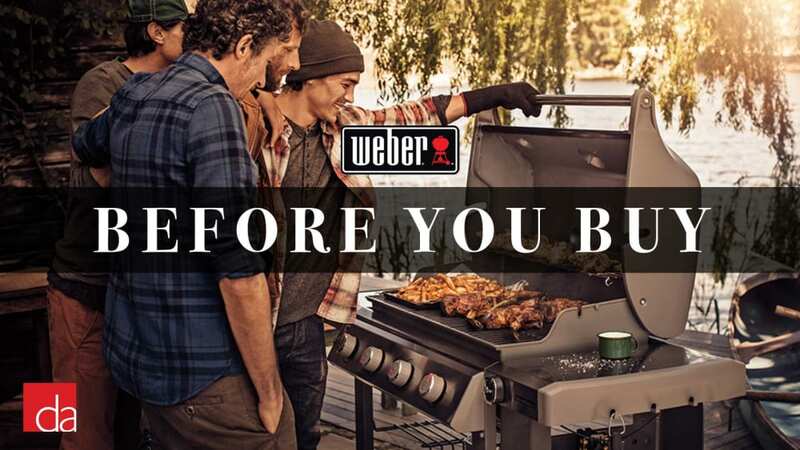 From inspiring an impromptu dinner in the backyard on a summer evening to tail-gating and camping trips to entertaining a pool party on Taco Tuesday to being a centerpiece in a fancy outdoor kitchen, Weber grills are a part of home. From Grilled Apple Pies to Zucchini Kabobs, and all the dishes in-between, Weber Grills have a special place in our heart and we are certain you and your family will feel the same. Can I turn off the valve on the LP tank to ensure safety when the grill is not in use? Taking an extra measure of safety is a good idea. However, turn the LP tank back on by slowly opening the tank valve; wait 60 seconds before igniting your grill. If opened too quickly you may trip the flow limiting device inside the regulator. Can I convert my Weber grill from natural gas to propane (LP) or from propane to natural gas? Weber does not support conversion on its grills. Techincally you should be able to replace the regulator and burners to accommodate a different gas consistency. However, even licensed plumbers do not like the risks associated with conversions.